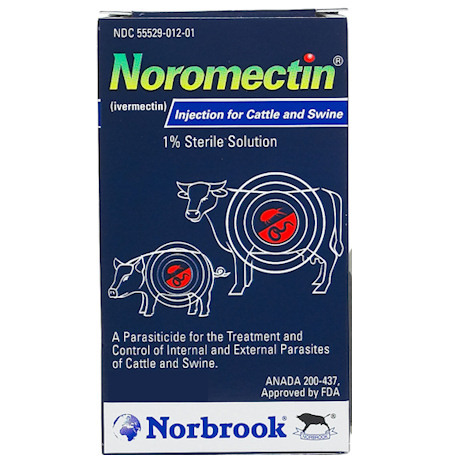 Ivermetcin Injectable 1% , Cattle and swine label - 50ml bottle. Indications Cattle: Treatment and control of gastrointestinal roundworms (including inhibited Ostertagia ostertagi), lungworms, grubs, sucking lice, and mange mites in cattle. Swine: Treatment and control of gastrointestinal roundworms, lungworms, lice, and mange mites in swine. Recommended Dose Cattle: 1 ml per 110 lb body weight, Swine: 1mL per 75 lb body weight. See package insert for complete indications and use directions. Precautions: For subcutaneous injection in cattle and swine only. Protect product from light. This 1% Ivermectin is labelled only for use in cattle, swine, reindeer, and American bison only.